The first complete translation of the Bible from the original languages into the Czech language was published in six volumes between 1579 and 1593. The third edition from 1613 is the most widely known and used Czech translation. 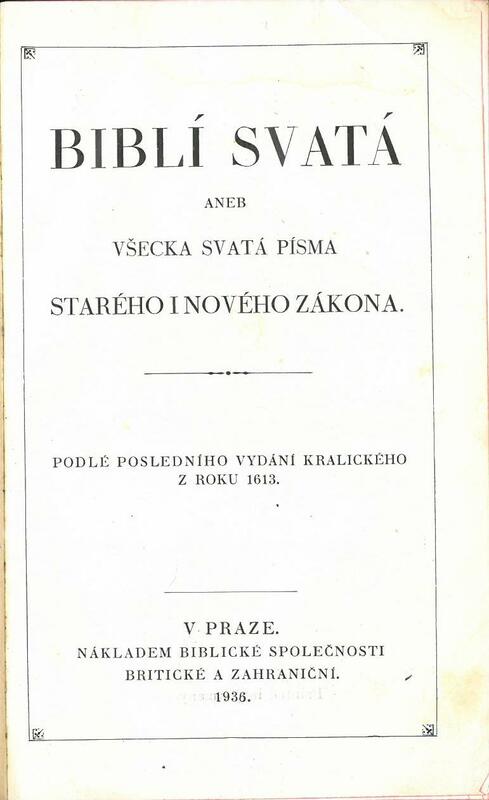 The Bible is called the Kralice Bible because in was printed in the town of Kralice nad Oslavou. Title: Biblí Svatá aneb Všecka Svatá Písma Starého I Nového Zákona. Podle Posledniho Vydáni Kralického z Roku 1613. Publisher: Praze: Nákladem Biblické Společnosti Britické a Zahranični.